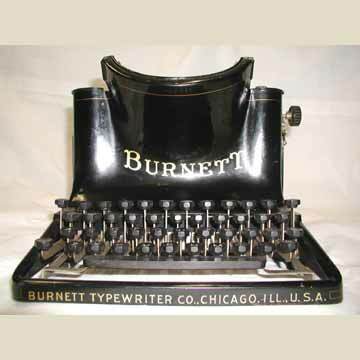 The Burnett typewriter was introduced in 1908 as a slightly changed version of the Triumph Visible that had been put on the market by the Visible Typewriter Manufacturing Company a year earlier. TThe Burnett was marketed by the Sears, Roebuck mail order company, but few were sold. The machine has an awkward appearance with the type laying backward at an angle, as a semi-frontstrike/downstrike machine. It is an otherwise common 4-bank typewriter. Popularly known as â€œthe urinalâ€�.